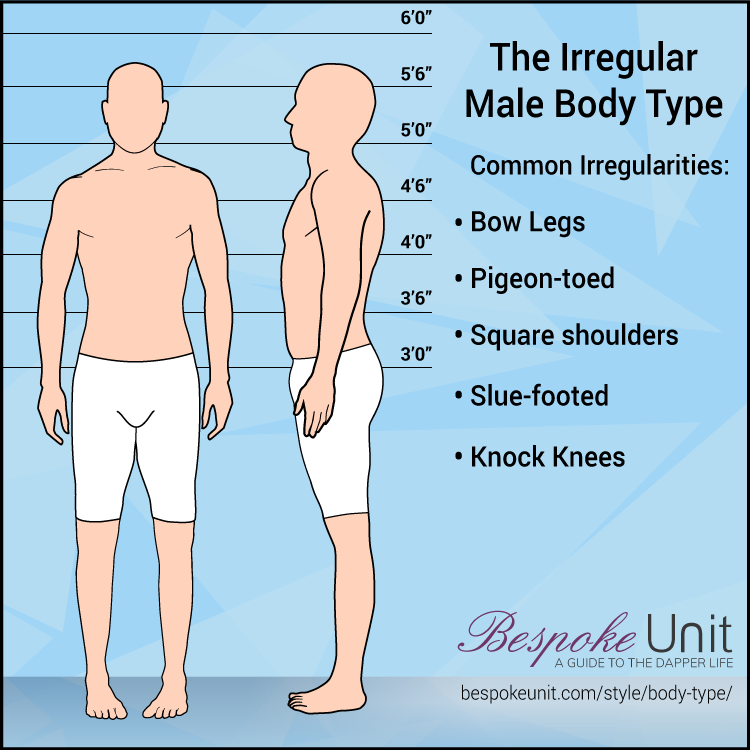 It’s a bit strange to talk about “irregular” body types as if they’re some deviation from the norm. Custom clothiers know that nearly everyone has some kind of irregularity with their body. In fact, it’s strange to be perfectly symmetrical. 95% of the human population has some kind of irregularity of the body that makes buying clothes more challenging than it would otherwise be. True symmetry is exceedingly rare; most of us are born asymmetrical, or injuries make us so. Some of us, though, are more irregular than others. You can be tall and thin and have knock knees. You can be short and stout and have sloping shoulders. “Irregular” isn’t a build unto itself but rather a qualifier to your build. 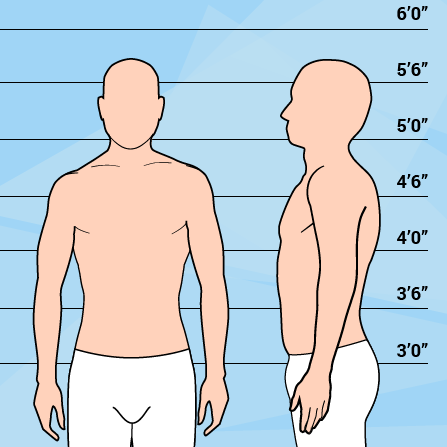 Please see our high-level guide which covers nine different body types. You’ll get help determining which body type is yours, easily jump to its article, and round out how you in particular should dress. If you’ve already read about your body type and are here because you meant to be, welcome. This is an important supplement that every man can benefit from reading. We’re all weird, it’s just a matter of how we’re weird, and to what degree. We’ve compared each irregularity to its “normal” standard so it’s easy to see where things deviate. 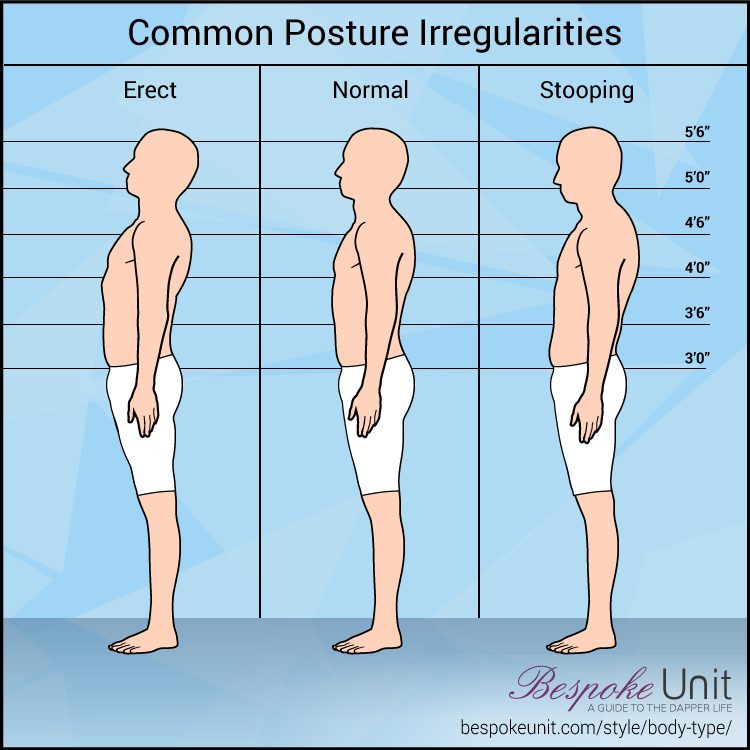 Erect Posture: Head leans backward and hips push forward when standing naturally. Affects jacket fit. Stooping Posture: Head leans forward when standing naturally. Hunchbacks are extreme examples of people with stooped posture. Affects jacket fit. For those with posture issues, a jacket’s front and back panels can be manipulated but really only if your suit is custom or made-to-measure. For those with stooping posture (also referred to as “head forward”), the back panel of the jacket is made longer so that it doesn’t ride up when standing. For those with erect posture (also known as “sway back posture”), the front panels of the jacket are made longer. It’s extremely important to note that almost no one has shoulder slopes that are 100% even. There is always some difference in where each shoulder sits relative to the other. This can cause issues with not just shirt and jacket shoulders, but sleeve lengths as well. Sloped Shoulder: Shoulders that slope downwards, creating a narrowing, droopy effect. Affects jacket and shirt fit. Square Shoulder: Shoulders that sit high on the body as if you were constantly shrugging. Affects jacket and shirt fit. Men with sloped or square shoulders will need to have their jacket’s shoulder padding manipulated. 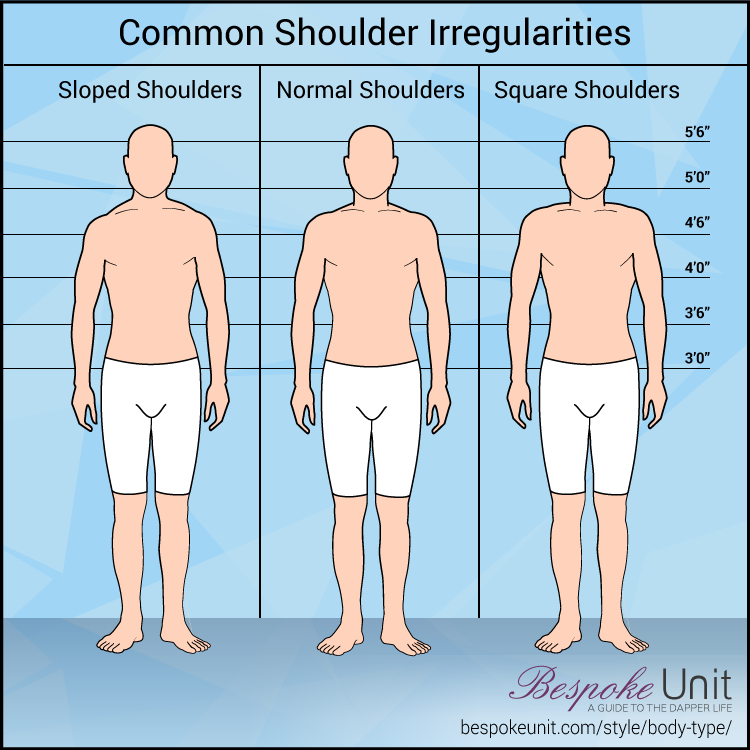 Sloped shoulders need extra padding to build them up, whereas square shoulders need less padding to avoid you looking like a football player. You can read more about jacket alterations here. Again, a made-to-measure or custom suit will factor your shoulders degree of slope into its creation, thus decreasing the need to alter shoulder pads. Shirt fit is affected by shoulder slopes (or lack thereof) as well. The top of the back of a shirt is referred to as the yoke, and high-end off-the-rack and custom shirts may have a split yoke, which accommodate for varying shoulder slopes. Knock Knees: Knees bend toward each other, affecting trouser fit. Severe cases of genu valgum, as it’s called in the medical world, involve the knees touching when the legs are straightened. 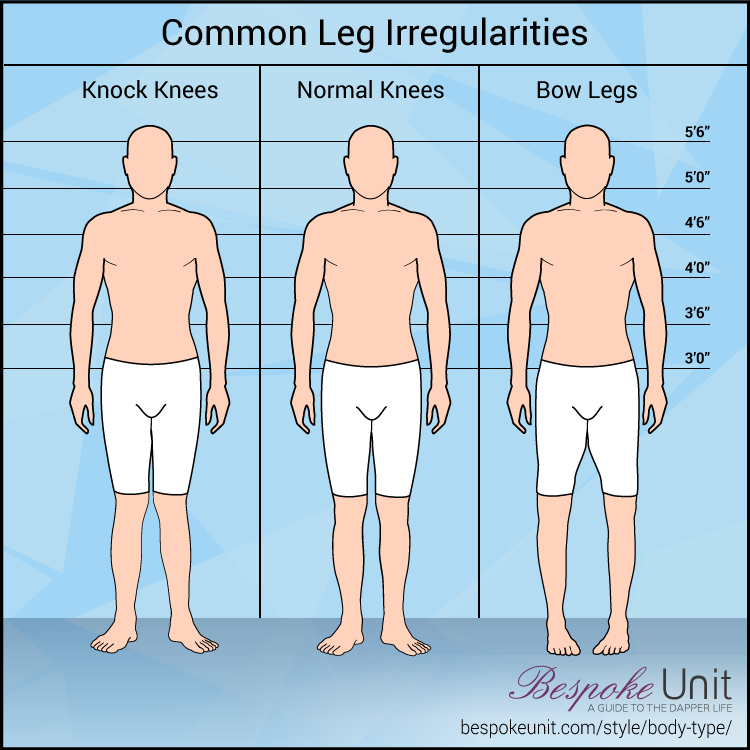 Bow Legs: Knees bend away from each other, affecting trouser fit. Sadly, there’s no alteration that can be done to fix trousers for those who are knock-kneed or bow-legged. This must be done on the pattern before a suit is even made, so the only way to accommodate this is to get a custom (not made-to-measure) suit. Pigeon-toed: One or both feet point inward towards each other. Affect’s one’s gait and trouser fit. Slue-footed: One or both feet point outward away from each other. Affects one’s gait and trouser fit. For those who are slue-footed or pigeon-toed, trouser creases can be “swung” after the pants are made. This is a difficult alteration, but it’s feasible. For those who are bow-legged or knock-kneed, your best bet is to have a suit specially made. There’s not much that can be done to a finished product that can accommodate that. 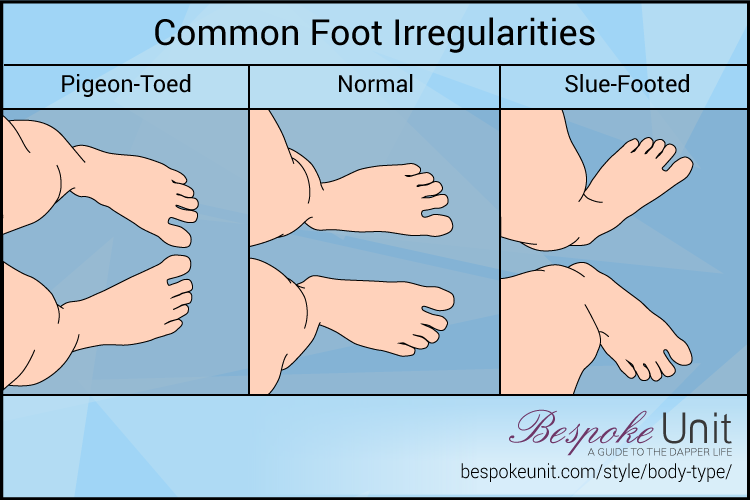 If one of your feet is at least a half-size larger than the other, buying shoes can be difficult. A common workaround is to fit the larger of your feet and then use insoles, heel grippers, and pads in the smaller foot’s shoe to accommodate it. This works well for plenty of men, but this is another instance in which made-to-order items will serve you particularly well. Shoes made specifically for you will keep different-sized feet in mind and then some. 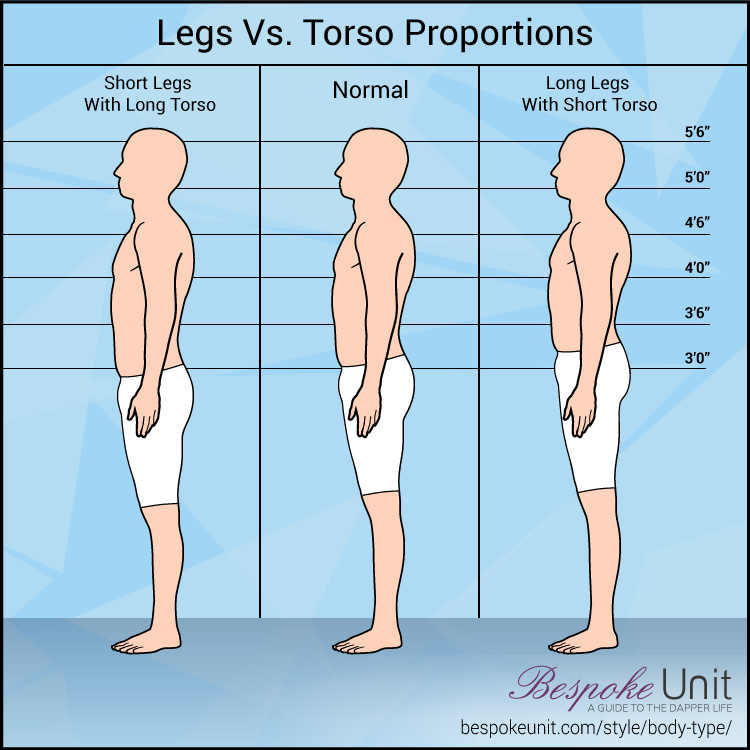 Short Legs & Long Torso: Height is derived more from torso than legs, creating an imbalance. If you’re tall but have a short inseam, this is probably you. Long Legs & Short Torso: Height is derived more from the legs than the torso, creating an imbalance. If you’re tall but wear a “regular” length off-the-rack suit jacket, this is probably you. If you have short legs relative to your long torso like Paul (this site’s founder & creative director), it’s particularly important to wear your trousers high-waisted. This will bring things into proportion. The opposite holds true if your height comes mostly from your legs. If you have a particularly long torso, you will want to wear extra-long or custom-made ties. Conversely, if you have a particularly short torso, you will either need to order custom ties or experiment with a bunch of different tie knots to get the length right. Men with particularly long torsos will also likely have to have braces custom-made. In general, a man with more severe irregularities will be best served by avoiding off-the-rack suits. Selecting made-to-measure will allow your suit to better accommodate your idiosyncrasies from the jump, decreasing the number and difficulty of alterations needed. Custom suits will do an even better job of this, as a pattern is created exclusively for you, keeping your slope-shouldered, long torso-ed self in mind at every step of the process. If you have the money and time to do so, make your life easier and get your suits made for you. This is a good idea for any body type. If you are quite muscular, we suggest taking a peek at our article on the athletic male body type.